Ok, so before I got this I did my research on Google and found that a lot people were having trouble using holographic nail polishes because of the formulation and the way they apply. 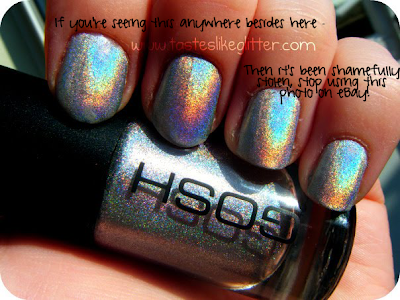 I saw someone blog about this who had used 4 coats of this polish for it to look fine. FOUR coats! That's just crazy. It goes on kind of patchy with the first coat but the second one soon fixes that. I did find that I got a few bald spots after applying the second coat but I just left it to dry and went over the few that need doing again. The only thing I would say is don't use a basecoat. Holographics do not apply at all well or stick to basecoats.